Halloween has always been one of my favorite holidays. Obviously, as a fat kid, I loved the candy (ha!) but even as a teen, I loved passing out candy. My grandma would come over, and my mom would make dinner. And my dad would take my little brother and me trick-or-treating each year until we were teens; then I stayed home to pass out candy. Once my family moved, the summer before I started 10th grade, we started the tradition of celebrating Mark's birthday. I looked forward to that every year! My dad would pick Mark up from the group home in the afternoon, and then we'd go to my parents' house for dinner and birthday cake. My dad would make a campfire in the driveway, and we would pass out candy to the trick-or-treaters. When my kids were born, they started going trick-or-treating from there, too. 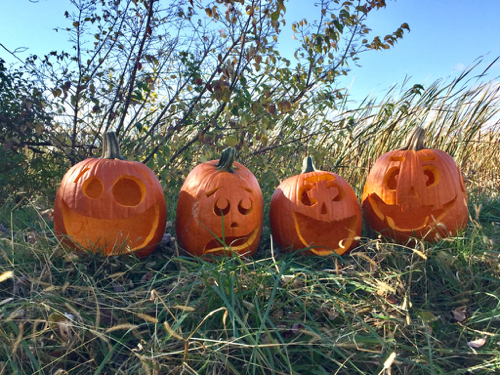 When Mark died in 2014, the first Halloween was hard. My parents weren't sure what to do without our usual tradition, and we didn't go over there for dinner. I bought ice cream and lots of toppings and delivered it to Mark's group home for the residents to have sundaes. I think Mark would have liked that ;) Then we all did our own thing. Jerry took the kids trick-or-treating at his mom's, and I passed out candy at home (to all of the eight trick-or-treaters that we got). Anyway, we haven't really developed a tradition as far as Halloween goes. But now that Luke is here, we did something fun that I hope we start doing every year--we went to Brian and Becky's house to have a fire in the driveway and pass out candy. They get a ton of trick-or-treaters! Brian bought about 180 full-size candy bars, and they only had about 20 left at the end of the evening. 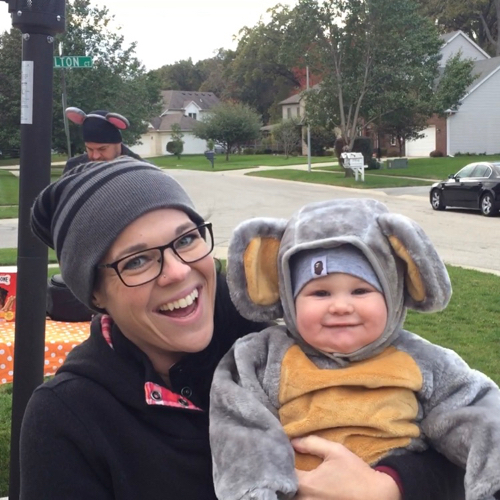 Luke was SO adorable dressed as a mouse! Becky looked super cute, too, and even Brian wore mouse ears. Then, I basically hogged Luke the whole evening. He was tired and pretty stone-faced, so I was determined to make him laugh. Or just smile a little bit. 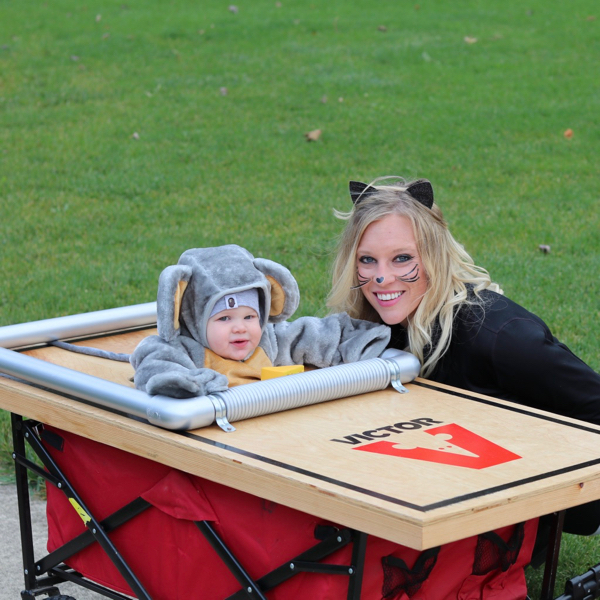 I loved seeing all the kids in their costumes--there were some very creative ones. My favorite was a girl who was dressed as Abraham Lincoln. I didn't even know she was a girl until we said how much we liked the costume and she turned to us as she was leaving and said, "I'm a girl, too!" for the shock factor. Haha! Jerry took Eli trick-or-treating around the neighborhood. 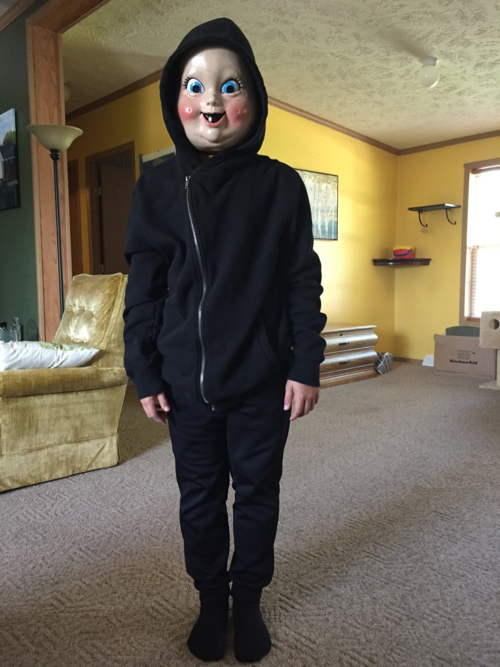 Eli wanted to dress as the killer from "Happy Death Day", a movie we saw on Friday the 13th. It was his first time going to a scary movie, and he was very excited about it. I told him that people probably wouldn't recognize his costume, but he didn't care. 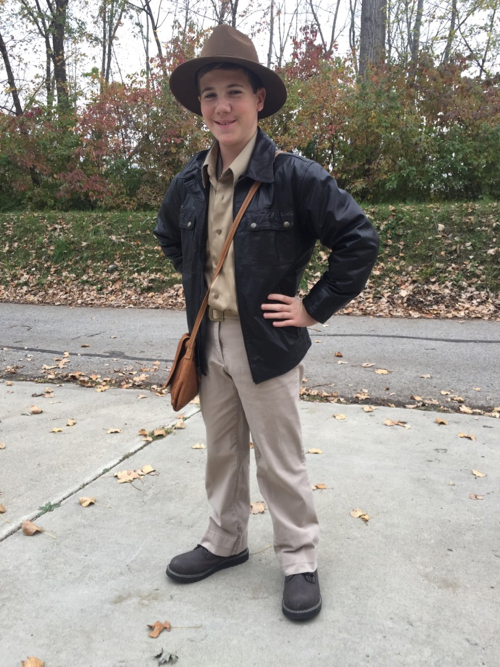 Noah dressed in the Indiana Jones costume I put together at the thrift store. I thought it looked awesome! 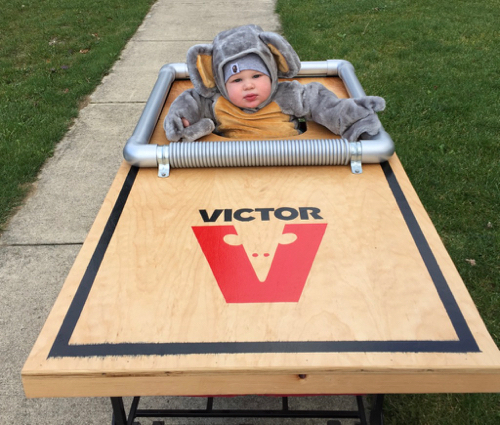 He went trick-or-treating with his group of friends, and he said all the adults recognized his costume right away. 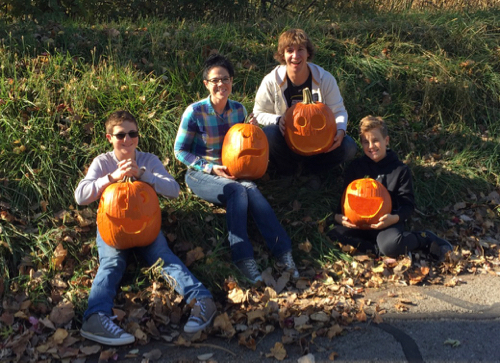 Earlier in the day, I wanted to get a photo of our family with the jack-o-lanterns we had carved. 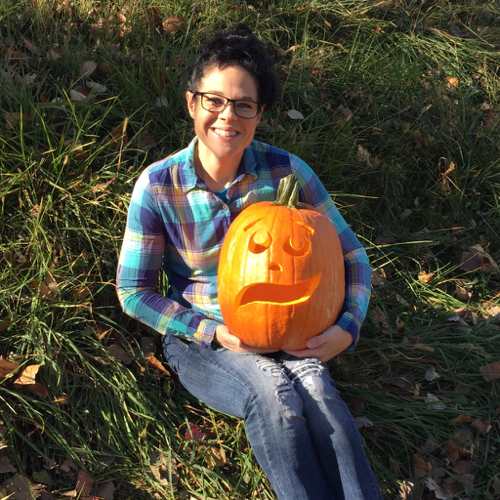 Jerry and I had a contest who could carve the better pumpkin (the kids judged), and I wanted mine to be unique. So, I made a bipolar pumpkin ;) I won. Obviously. Anyway, I tried getting a family picture with my phone using an elaborate setup of a step stool, a book to prop up the stool at an angle, a broken iPhone tripod, and a couple of other things. We had it all in the street to get the picture, and then a car came down our street (we only have cars pass by about five times a day!). I moved everything, and as the car passed, a girl rolled down the window and asked if we wanted her to get the picture. So much easier! Here is my 1 Second Everyday video for October. I can't believe I've been doing it for 10 months now! I'm super excited to watch the whole thing at the end of December. How fun! 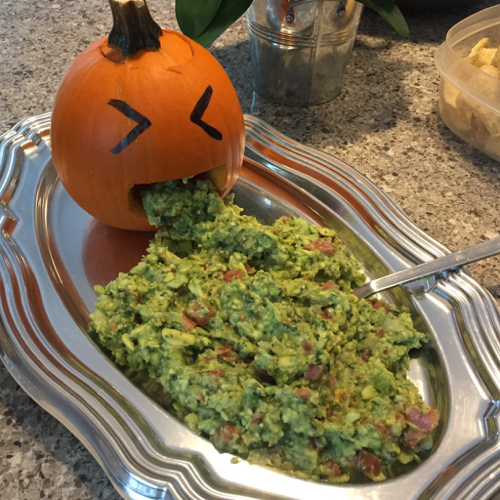 That guacamole looks so good -- and the picture with the pumpkin makes it look fun and adorable! Did anyone else get a bunch of adults at their doors for trick or treat? I had a handful that were dressed up and seriously looking for candy -- I made a joke about "go to Walmart and buy a bag..." which would be easier than going door to door -- but honestly I felt kind of weird about it. What's the age cut off for Trick or Treaters?